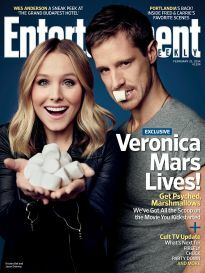 Mandy's Mind: Veronica Mars time yet? I was an original VM fan, yes, I am that old, I watched it each week from start to sad finish.... it was one of those shows I first got upset about when it ended. Needless to say, when rumours started that there would be a movie, I was excited.... to see it finished now... thrilled... let's get that movie on my screen ASAP! I LOVE Jason Dohring... FLOVE!!! Beisdes the Rolling Stone cover (As Rob Thomas put it, in an update to Kickstarter backers, “That’s right: ten years after Veronica Mars first appeared on television, and eight years after getting canceled, we’ve finally landed the cover story in Entertainment Weekly.”) the other news this week includes a clip (watch here) tickets go on sale Valentines Day... squeee!